Two well-known former regional daily editors who worked together around 25 years ago have joined forces again to write the biography of a record-breaking glider pilot. 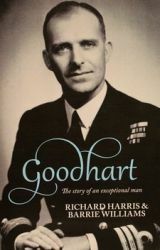 Former Nottingham Post editor Barrie Williams recruited his former assistant editor Richard Harris to help write the biography of the late Rear Admiral Hilary Charles Nicholas Goodhart, who was known as Nick. The journalists worked together at the Post in the late 1980s before both moving on to edit other titles, and have stayed in touch since despite living 400 miles apart. Richard left the Post to become editor of the News and Star in Carlisle and sister weekly the Cumberland News on Barrie’s recommendation but was sacked after three-and-a-half years and, in a frank autobiography published last year, admitted he had not been up to the job. Barrie, who became editor of the Western Morning News, has also written a number of books previously, including two biographies and his own autobiography, which told of his controversial departure from the title. He was asked by Goodhart to write his biography before his death in 2011, which was going well until Barrie reached the chapters about his achievements as a glider pilot. Said Barrie: “Nicholas sat down to tell me all about it and I didn’t have a clue what he was talking about! The book, called Goodhart: The Story of an Exceptional Man, tells how the glider pilot flew higher, further and faster than any Briton before him and one of his records still stands to this day. His other achievements included the invention of the life-saving Mirror Deck Landing System which was taken up by every one of the world’s navies that had an aircraft carrier, his design of the pioneering Sigma glider and the building of his Newbury Manflyer, a huge aircraft powered only by two men on bicycles which successfully took to the air. Richard said: “I’ve met many exceptional people in my time – but none of them has come anywhere near being as exceptional as Nicholas Goodhart. The book is available from Woodfield Publishing.